According to the Inter-governmental Panel on Climate Change (IPCC), the energy sector of a country’s economy comprises electricity generation, transport, residential, commercial, agriculture, fisheries and fugitive emissions from fuel mining. The results of an emissions trend analysis conducted as part of the GHG Platform-India project show that the energy sector is the largest contributor of Greenhouse Gas (GHG) emissions in India. 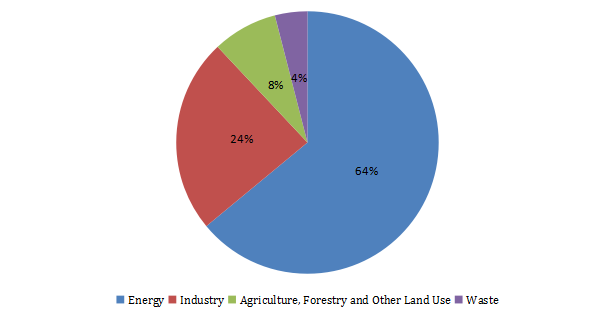 It accounted for 64% of the total emissions (including Land Use, Land Use Change and Forestry estimates) in 2012. CO2 accounted for 99% of the total GHG emissions between 2007 and 2012. Electricity generation, constituting 71% of the energy sector’s emissions, grew at a Compounded Annual Growth Rate (CAGR) of 7% from 2007 to 2012. The emissions from utility-scale power plants increased from 674 to 916 Million tons of CO2 equivalent (MtCO2e), while that from captive- power plants increased from 85 to 139 MtCO2e during the same period. The increase in emissions from electricity generation can be attributed to the growing demand for electricity and low generation efficiency, in addition to policies implemented towards rural electrification. The emissions from the transport sector (road, railways, navigation and aviation) increased from 164 to 230 MtCO2e between 2007 and 2012. Road transport emissions contributed more than 85% of the transport emissions, registering a CAGR of 7.61% in this time frame, whereas the overall emissions from this sector grew at around 7%. Growth in population, motorisation and rapid urbanisation are the key drivers for the increase in transport sector emissions. Emissions generated from the residential sector due to burning Liquified Petroleum Gas (LPG), Natural Gas (NG) and diesel have shown an increasing trend, while the emissions from fuel wood and kerosene have declined during 2007-12. The overall emission from the residential sector has increased by less than 1% annually during these years. The emissions from commercial, agriculture and fisheries sector grew at 12%, 6.6% and 1.9% per annum, respectively in this period. Emissions from burning diesel in generator sets, tractors, agriculture pump sets and fishing fleets contributed 90% of the total emissions from these sectors. However, increased penetration of cleaner cooking fuels along with better electrification rate has stabilised the emissions growth rate. Fugitive emissions grew at a rate of 3% annually from 2007-2012, with about equal contribution from coal mining, oil and NG extraction. In the same period, the fugitive emission from coal mining grew at 6% despite a shift in coal mining method (underground to open cast mining), while the emissions from oil and NG production increased at 1% every year. The overall emissions from the energy sector are expected to increase owing to the developmental aspirations and projected economic growth of India. Electricity demand from the industries and buildings sector is anticipated to increase in the coming years, due to policies like Make in India that incentivises indigenous manufacturing, and enhanced quality of life. Higher disposable income would also contribute to increased motorisation and penetration of appliances in households, which may contribute to emissions growth in the transport and residential sectors. The fugitive emissions from coal mining would increase by two-fold by 2022, as the government has proposed to ratchet up coal production, with a target of 1.5 billion tons. However, it is important to acknowledge at this point that the government is also implementing policies that will help India chart a sustainable and low carbon growth trajectory for itself.